Media Type Formatters in the WCF Web API provide a way for the consumer of your service to not only specify the format they want for their response, but also specify the format they are using on their request. Typically the desired response format is specified in the "Accept" request header and the request body format is specified in the "Content-Type" request header. Media types are central to building any RESTful service. Two of the most common media types are "application/xml" and "application/json". However, to build a truly RESTful service that is hypermedia driven, these media types should not be used. Instead, a media type that indicates the specifics of your application domain and has rich semantics for hypermedia is preferred. For my example, I'm going to use the Nerd Dinner domain since it's something most people are familiar with. I could just use "application/hal" for my media type but instead I'm going to use "application/vnd.nerddinner.hal+xml" to more clearly indicate the specifics of my application's domain ("vnd" indicates a vendor specific domain). One of the core tenets of REST services is loose coupling between the client and server which allows evolvability. Clients need to know about the bookmark URI (i.e., the "home page" so to speak) but should not have knowledge of any other URIs. Instead clients must understand the link relations (i.e., "rel" attributes of the elements) and just "follow the links." 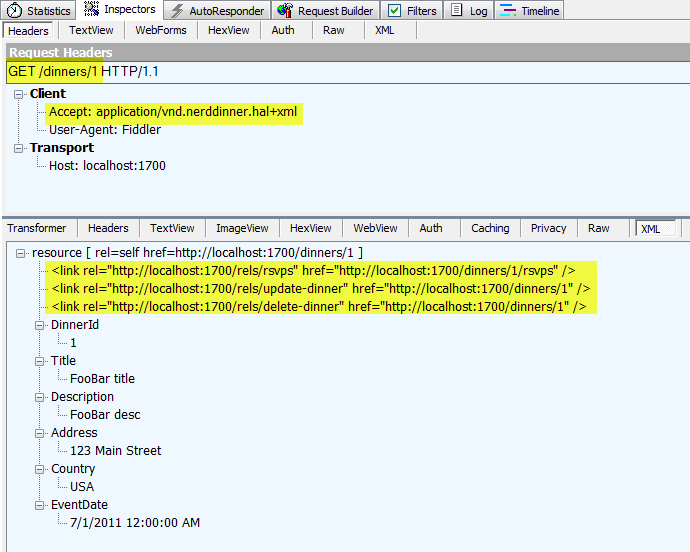 Notice I passed an Accept header of "application/vnd.nerddinner.hal+xml". Also notice the three elements that came back in my response – this is my hypermedia. The Link Relations are in URI format and the client must have knowledge of what these mean. The code snippet below shows what my custom HalMediaTypeFormatter currently looks like. Notice line #18 in the constructor shows the media types that the formatter is intended to support. There are a couple of very important things to note in the code above. First, on line #23 I am setting the Accept header of the request (the variable was defined on line #15). Second, when I deserialize the xml to a .NET object on line #27, I pass the formatters in (which is just my HalMediaTypeFormatter) so that it knows how to deal with this request. If I don't do this correctly, I'll get an InvalidOperationException: No 'MediaTypeFormatter' is available to read an object of type with the media type . As you can see from the example above, I'm using the same custom Media Type Formatter on both the server and the client. As I mentioned earlier in this post, the coupling between the client and server should be focused on defining the link relations for your media types. Stay tuned for my next post where I'll show a mechanism for leveraging a media type formatter (like the one shown in this post) to generate documentation for consumers of your service so that consumers can fully understand all hypermedia link relations. The complete solution for the code sample above can be downloaded here.